Come and meet serving soldiers and horses from the Household Cavalry Mounted Regiment in this day of talks, workshops and family activities. Meet serving soldiers from the Household Cavalry and find out why their job is known as the best of both worlds. See saddlers at work. Hear how the regiment provides veterinary care for its horses. And examine items of uniform from its Full Dress store. Meet a member of the Defence Animal Training Regiment and learn more about their work. Create your own hobby horse and gallop around the Museum. 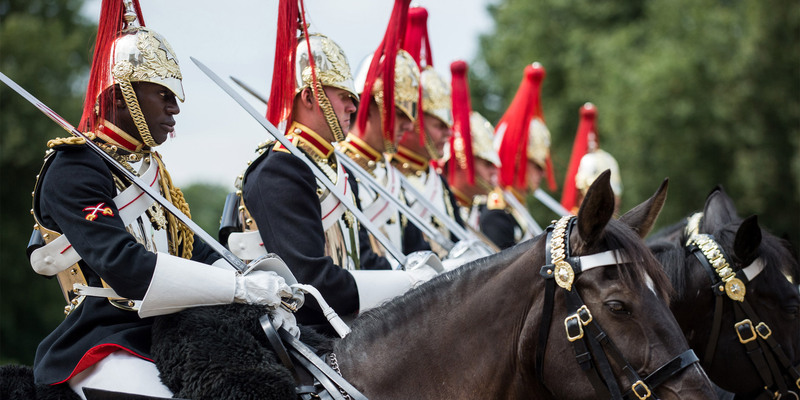 The horses of the Household Cavalry, known as 'Cavalry Blacks', have been guarding the Royal Family and taking part in ceremonial occasions since the restoration of King Charles II in 1660. Come and meet a 1685 Lifeguard and an 1815 Royal Dragoon as they highlight how their roles have changed over the centuries. Join the woodwind quintet from the Army’s largest symphonic wind band for music in the Atrium. Watch a live farrier demonstration, showing how the regiment looks after its horses’ feet. The Drum Horses of the Household Cavalry take part in ceremonial occasions carrying two solid silver kettle drums. They hold the rank of major, making them the most senior animals in the Army. Curators from the Household Cavalry Museum and Archive will give a talk on the regiment’s service from the 1660s to the present day.